Snippet one pix: In the background is Wheel of Life by Elisabeth Kubler-Ross, her bio is extraordinary and her research and beliefs have brought me much comfort since Marina’s death. I volunteered a ‘guest book’ to be passed around and found I had a hand pressed paper journal with blank pages and a purple cover. Perfect! It was passed around over the weekend for Marina lovers to share their love with Sharon and Mike. ♥ I haven’t written in it yet, and am collecting notes to add from anyone who missed sharing or who wasn’t there in person. Will wing to Sharon as soon as it’s ready. 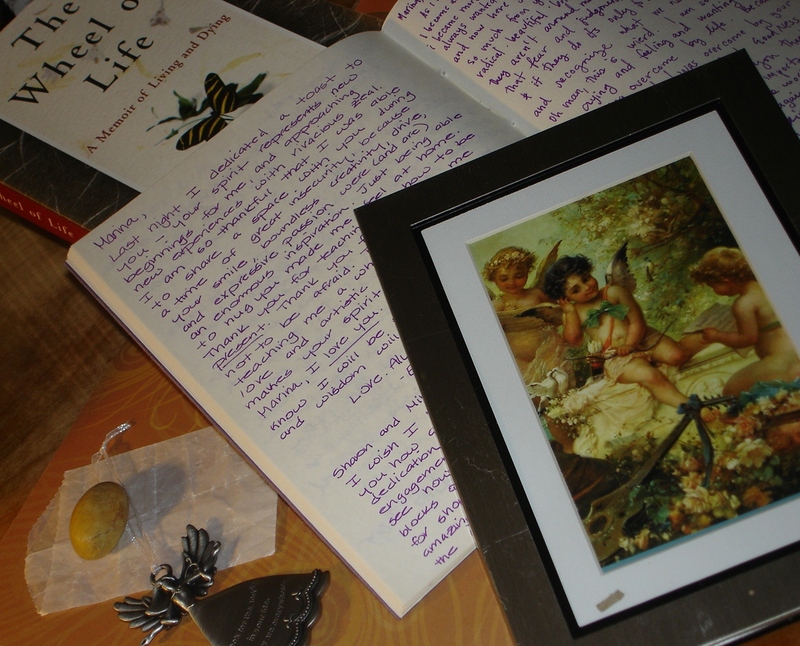 The angels were Marina’s and Sharon gifted them to me as a keepsake. What treasure. The baggie is from the scattering of the ashes and still holds smidgens of Marina. I walked along Pine Lake and closed my eyes holding Marina in my inner eye and picked up a smooth stone as a talisman. There were so many exquisite moments to savor and share…one snippet at a time. 27 Apr	This entry was written by Laura and published on April 27, 2013 at 7:00 am. It’s filed under Authenticity, Beauty, Celebration, Connections, Friendship, Gratitude, Inspiration, Laura, Love, Memories, Relationships. Bookmark the permalink. Follow any comments here with the RSS feed for this post.